The existence of a purely ionic or covalent bond represents an ideal situation. In the covalently bonded molecules like H2, Cl2, F2 (homonuclear diatomics), the bond is a pure covalent bond. However, no specific charges are being found on H or F and the molecule as a whole is neutral. Thus the extent of ionic character in a covalent bond will depend on the relative attraction of electrons of the bonded atoms which depends on the electro negativity differences between the two atoms constituting the covalent bond. Polarisation of a covalent bond causes fractional charge (Delta + or Delta - ) on the atoms which are separated by the bond distance. This causes a dipolar molecule formation. As a result of polarisation, the molecule possessed a dipole moment. In a triatomic molecule like water two covalent bonds exist between the oxygen atom and the two H atoms. Oxygen with higher electronegativity attracts the shared pair of electrons to itself and thus oxygen becomes the negative end of the dipole while the two hydrogen atoms form the positive end. Thus the two covalent bonds in the water molecule possess partial ionic character. Generally larger the electronegativity difference between the atoms consisting the bond, greater will be the ionic character. For H atom electronegativity is 2.1 and for Cl atom it is 3.0. 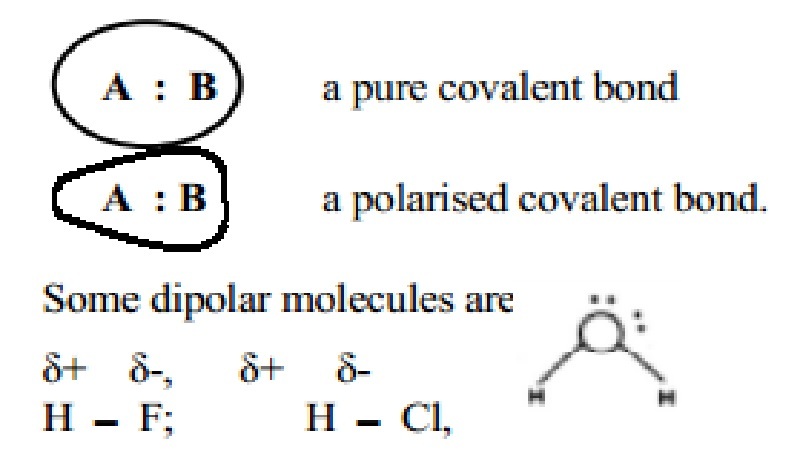 Thus H-Cl covalent bond is polarised and it has more ionic character. Consider the molecule like hydrogen cyanide HCN, the bond between hydrogen atoms and the cyanide anion is of covalent type. CN- ion has more capacity to pull the shared pair of electrons in the H-CN bond that, partially H+ CN- are created. Thus in water medium this compound is ionised into H+ and CN- ions.